Speedyramp is also available in the TOUR version, this new aluminium ramp has a distinctive feature: it can rotate! This also allows for the loading of materials and goods quickly and greatly facilitates logistics. 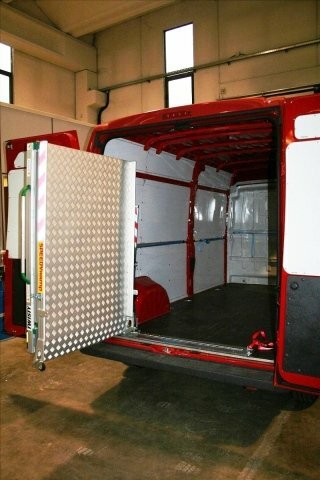 TOUR RAMPS, aluminium ramps for loading and unloading goods are available in various sizes and capacities and, like the other ramps from the SPEEDYRAMP LIBERTY series, they do not require approval for installation, can easily be removed, and meet all the regulations in the field of transport and loading goods in Italy and Europe. Plant specialists - electricians - plumbers - cleaning companies and services - transport of: paper - wine - mineral water plants - flowers - stairs - groceries - furniture - clothing - paints - carpet - computer appliances - catering facilities - industrial laundries spare parts - planners - extinguishers - lubricants - spare parts - sanders - scrubbers - paper sweepers - motorcycles - bikes - scooters - air generators - gardening machines - work carts - tiles - traffic lights - fireplaces - horizontal pneumatic marking machines - transport of the elderly and disabled.